Newsworthy and trendsetting! Follow us as we bring you buzz from all media outlets, from gossip to celebrity spottings, movies and music videos to look for and more. You will also see celebrities wearing designer dresses such as Sherri Hill, Jovani, Faviana that can be found here at Rissy Roo's. This years hot topics with the leading trends for the season, awesome fashion tips, trendy styles are just a few things to be seen here at RissyRoos.com. Thank you to all of our local Roo Girls for joining us at our Grand Opening Party! We loved celebrating our reopening the weekend of September 14-16th at our brand new location: 322 Tilton Road in Northfield, NJ 08225. We closed our Linwood location in June and worked tirelessly all summer to make our new location in Northfield feel like home. We've brought all of our same tried and true formal fashions to Northfield along with some more dress additions, shapewear, more shoes, and fabulous jewelry and accessories. 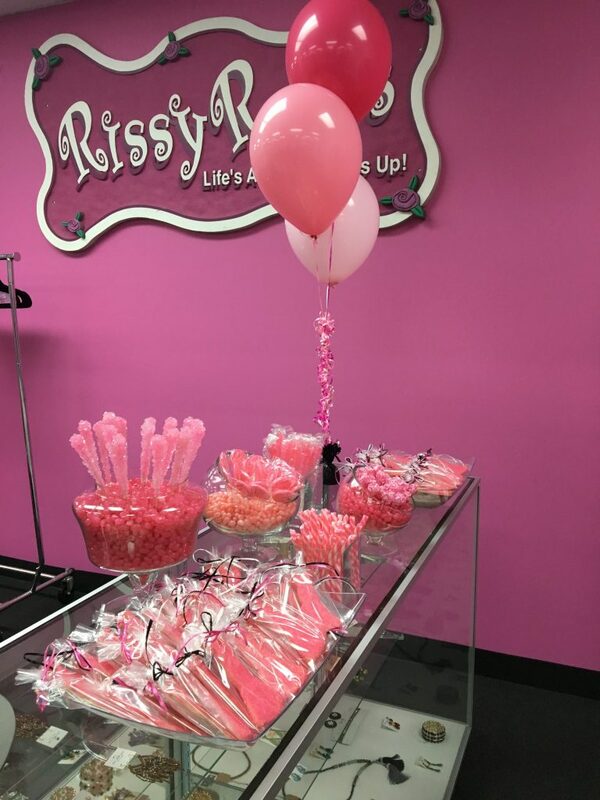 In true Rissy Roo’s style, we celebrated our grand opening with an assortment of pink candy and pink balloons, but nothing could top our brand new Rissy Roo's signs! We are so excited to debut our new backlit Pink signs that light up Tilton Rd. with the essence of Rissy Roo's. As the headline for a recent article published in The Current of Linwood, Northfield, Somers Point states "Rissy Roo's puts on the pink at new Northfield location." Our grand opening weekend was packed with fun activities. You could pose in front of our fabulous photo backdrop, indulge in pink sweets, and enter your name in our raffle, where you could win free shoes, purses, and even a free prom dress! Congrats to all of our winners! Our new store is absolutely beautiful, and perfectly PINK! The front of the store is full of all of our beautiful dresses, and the back has a special, private dressing room area. For those who have been customers since the 1990's and early 2000's, you may notice a special throwback: our original Rissy Roo's sign, sitting front-and-center in the store. 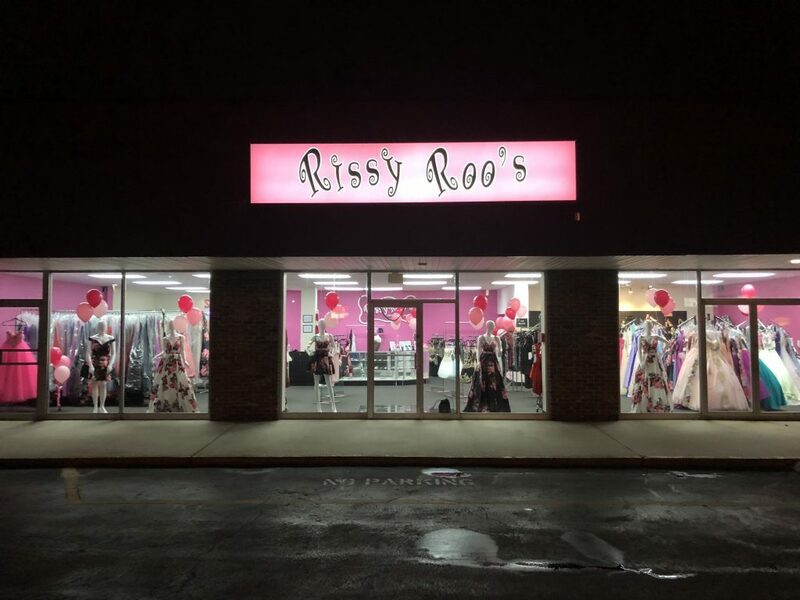 For over 20 years, Rissy Roo’s has made your dress dreams come true with designer gowns perfect for a wedding, Bat Mitzvah, Sweet 16, Homecoming Dance, and of course, Prom! We love getting to know each and every one of our customers, and we are so excited to start this next chapter with you. There are lots of exciting new things planned for the future, including shape wear, so you can look and feel your best at any event. We especially love when you share photos with us, so stop by, check out our new store, and snap a picture in our photo booth area. Don't forget to use the hashtags: #RissyRoos and #RooGirl. You might even get featured on our Facebook and Instagram pages! We're open Monday-Saturday from 10am-6pm, and Sunday 11am-5pm. If you're looking to call us, our number is the same as always: 609-926-9200, and you can always contact us via email at info@rissyroos.com. This entry was posted in In The News and tagged Rissy Roo's, Roo's News, Newsletter, In The News, news on October 10, 2018 by Chrissy Roos. NJ.com Counts Down Yelp's 31 Best Prom Dress and Tuxedo Rental Shops in N.J., And It Includes Rissy Roo's! The prom 2018 season is on in full force, and it's time to begin the search for that perfect prom dress. Whether you're going for lace, florals, two piece, mermaid, or so many other gorgeous trends, you'll feel like a princess on prom night once you find that dress where you feel beautiful, confident, and comfortable. As NJ.com explained in their article, and as any high school girl knows, that search for the perfect prom dress can be a daunting one. Usually, you either have an image of exactly what you want, but can't find it, or have no idea what you want at all. To help make the decision process easier for those living in New Jersey, NJ.com listed out the 31 best prom dress and tuxedo rental shops in New Jersey according to data they collected from Yelp. Of course, Rissy Roo's made the list! Our Linwood, NJ store was listed as number 29 according to Yelp's data. 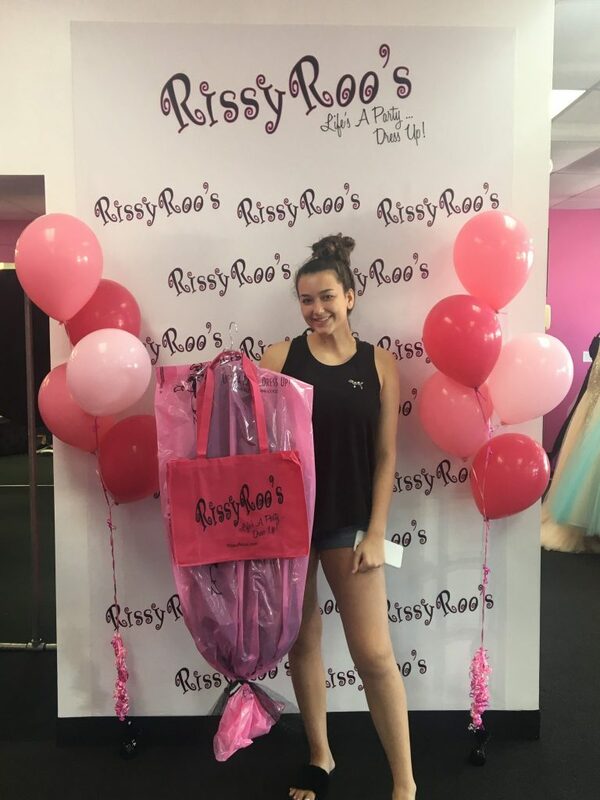 "My daughter and I look forward to shopping at Rissy Roo's every year for her high school formal events! This year was the best yet! Awesome customer service! Plus, all of the girls were helpful, kind, patient and made my daughter feel like a princess!" We love helping our customers find their perfect prom dress, whether in person, over the phone, or via email, so we were so happy to read such a nice, thoughtful review! While we love seeing our customers at our Linwood, NJ store, you can shop our dresses from anywhere in the world at RissyRoos.com. 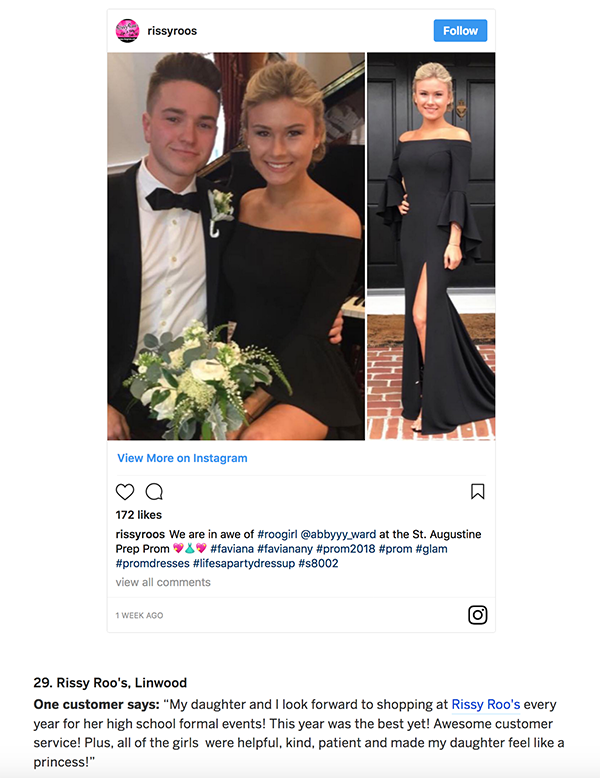 This entry was posted in In The News, Prom Dresses and tagged Prom Dresses, Roo's News, Prom dress, In The News, NJ, New Jersey, news, Prom 2018 on April 12, 2018 by Chrissy Roos.